To clean silverware with toothpaste, place a clean cotton sock on your polishing hand. Toothpaste is an easy, inexpensive cleaner for silverware. Dampen the sock slightly under cool running water, and squeeze a pearl-sized drop of toothpaste or polish on your "gloved" fingertip. 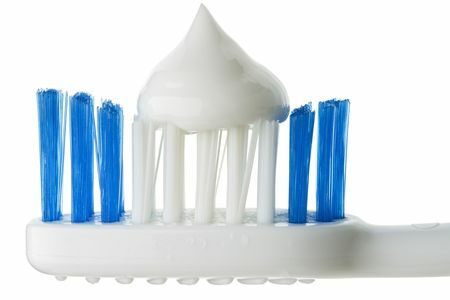 Apply the toothpaste to the silver using up-and-down, rather than circular, strokes until the tarnish is gone. Use a twisted bit of rag or a toothbrush to get between tines and other tight spaces. Rinse well and polish it dry with the clean, dry side of the sock. For general silverware cleaning, rinse under warm running water and use a mild soap, such as dishwashing liquid, to remove surface dirt. Resist the urge to submerge: less is more with this precious metal. Store silverware in an airtight plastic bag or in a chest lined with tarnish-resistant flannel. Resist the urge to bundle it in rubber bands: rubber can also cause discoloration. Avoid serving sulfur-containing foods such as mayonnaise and eggs from your platters - they'll cause tarnishing. Always test a small area first to make sure the polish is compatible with your piece before tackling the entirety.